This is a kind of electronic pulse analgesia pen, fast stimulate nervous system and relieve your body pain, activation of natural defense system of the brain and spinal cord analgesic endorphins the human body, so as to provide effective treatment to alleviate. Effective for both acute and chronic pain, such as muscle pain, back and shoulder pain, headache, migraine etc. Have a try. Fast stimulate nervous system and relieve your body pain. Suitable for acute or chronic pain, such as muscle pain and shoulder pain. The utility model relates to a pen with a pulse shape, which has the advantages of quick effect, portability and convenient. With transcutaneous electrical nerve stimulation for the working principle, through 30 seconds of pain points or acupoint stimulation. Activation of natural defense system of the brain and spinal cord analgesic endorphins the human body, so as to provide effective treatment to alleviate. 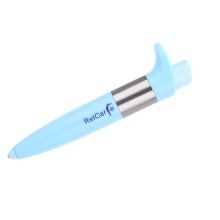 Easy to use: Fusion of modern fine quality massage pen, good for health promotion. No injection medication, no battery or exteral power, pure natural therapy. Effective pain relief: Effective for both acute and chronic pain, such as muscle pain, back and shoulder pain, headache, migraine etc. Applicable to hospital, experience shop, beautysalon and home use, suitable for human wrist, foot, elbow, ankle neck, waist, back, ear, face, shoulder, back, leg, knee etc. Convenience: self-help therapy, anywhere anytime, point where is the pain, easy to use. Long life: the product has been tested and can be pressed in around about 100,000 times. A good gift for your paternts and friends.